When The Simpsons introduced the cute three-eyed orange fish called Blinky, it was just a silly commentary on the fact that there was a nuclear power plant in the town. But it turns out that the creators of the show may have been more right about the effects of nuclear waste than anyone knew at the time. 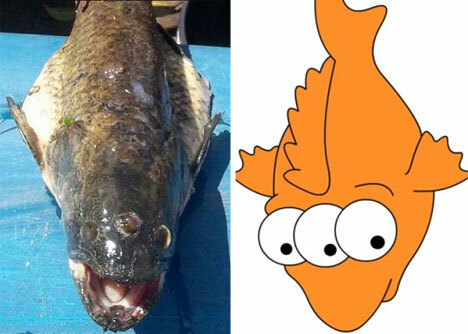 Recently, five fishermen in Argentina caught a real-life Blinky in a lake that receives runoff water from a nearby nuclear power plant. Because the catch occurred at night, the fishermen didn’t notice the fish’s extra eye at first. But when they turned a flashlight onto the wolf fish in their boat, they were shocked to see the surplus eye staring back at them. 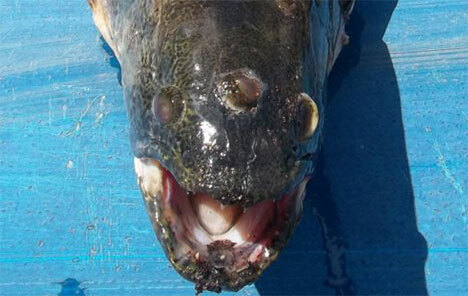 The men who caught the mutant say they have been fishing in the same spot for years but have never encountered a creature like this before. Not surprisingly, they’ve decided to skip frying up this bizarre specimen – instead, they plan to send it off for scientific testing.